Jno. 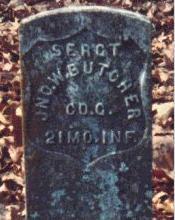 W. Butcher was born in Kentucky in 1838 & was living in Clark County Missouri when he enlisted on July 12, 1861. At the time of his enlistment, he was single, 23 year old farmer, and stood five foot seven & three quarters inches tall with light hair & dark light eyes. He was mustered in on Feb. 1st, 1862. Promoted to Sergeant, April 10, 1865. Mustered out April 4, 1866. He died August 3, 1905. He is buried in De Soto City Cemetery, De Soto Mo.